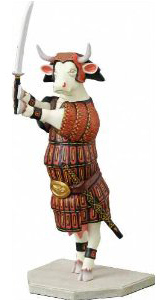 Does a cow with three horns mean good luck? For today’s post I’d like to thank my fellow blogger Sharon at The Real Sharon for sharing her discovery, and chastise Facebook for making changes that don’t improve my life in any way. Two days ago, Sharon posted a photo on my Facebook wall. I never saw it. Until this afternoon. Facebook made its most recent changes earlier this week and it now first displays my “top stories” in my newsfeed, then my “most recent stories”. Somehow it also decides what I’ll be interested in reading, and what I won’t. Apparently it decided I wasn’t interested in seeing Sharon’s photo, even though I post links to this cow-related blog on my profile daily. Here’s a hint for you, Facebook: the keyword is COW. 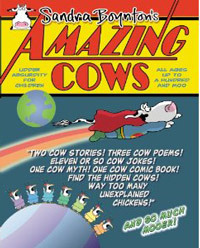 If it says cow, I want to see it. The only reason I saw Sharon’s photo today is because I clicked on my own profile after uploading new photos and not seeing them appear in my newsfeed. I scrolled down a little and then I saw it. A three-horned longhorn cow! 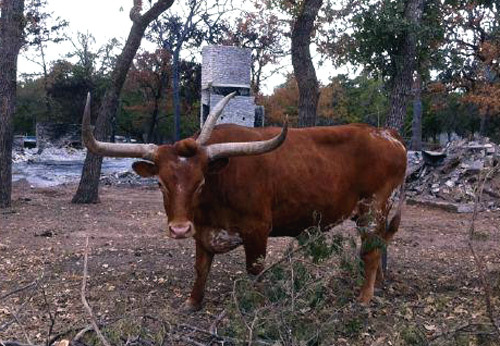 This interesting specimen is from Texas (of course, where else would you find such longhorn?) and this is absolutely all I know about it! But I think it looks really cool. Don’t you? Glad you found it on your profile…shame on Facebook! I figured you might think it was cool. Thanks for sharing this cow, it’s really cool looking!